Karl Boyce, Aude Hermenier, Alexia Fillion Lauzon and Alexis Drolet. A team of HEC Montréal students turned in a strong performance for the second straight year, finishing 3rd in the Inter-University Student Tournament, an international industrial economics competition held during the fall term. HEC Montréal beat out a number of universities with worldwide renown in industrial economics, including the Toulouse School of Economics (TSE) and the universities of Michigan and Chicago. 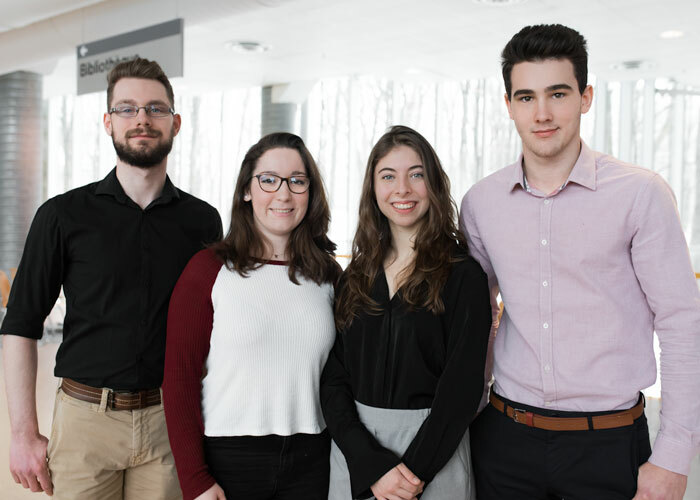 Team members Karl Boyce, Alexis Drolet, Alexia Fillion Lauzon and Aude Hermenier are all first-year students in the AGIR cohort of the Bachelor’s in Business Administration (BBA) program. They were given no special coaching for this competition, but did receive advice from the 2017 winning team – helping them create an effective Excel tool for a simulation they had to complete. “Our approach in the AGIR cohort is very much based on practice and teamwork, and that certainly stood us in good stead,” says Alexia Fillion Lauzon. The Inter-University Student Tournament is an initiative of Economic Games, a game website designed for teaching economics. The student competition is a simulation in which players have to determine the price and quantity to be produced of a good or service, and the choice of an appropriate technology. Competitors must consider production costs and the environmental impact of their choices, while maximizing their profits. Competitors played online for one month, in a round divided into two phases, each with several turns. They were faced with new parameters every turn, forcing them to adjust their calculations and regularly submit new decisions.